Located at the Lorraine Motel, the assassination of Dr. Martin Luther King Jr., chronicals key episodes of the American Civil and human rights efforts globally, through collections, exhibitions, and educational programs (Admission Additional). A recording studio opened by rock pioneer Sam Phillips. It is widely known as the birthplace of Rock & Roll. Blues and R&B artists like Howlin’ Wolf, junior Parker, Little Milton, B.B. King, James Cotton, Rufus Thomas, and Rosco Gordon recorded there in the early 1950’s (Admission Additional). AUTHENTIC AMERICA ON THE MIGHTY MISSISSIPPI - Have you ever wondered what this country looked like to its early explorers and pioneers? 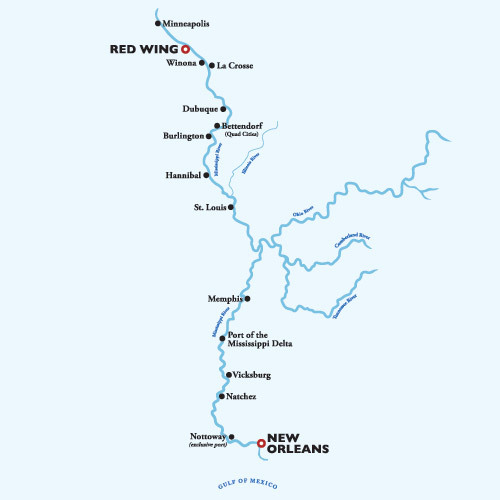 Traveling on the Mississippi and its tributaries aboard the elegant American Queen, you will be transported back in time to an era of leisurely and romantic travel. Storybook American towns and vibrant, bustling cities combine with the sweeping panoramas and deep blue lakes which inspired the works of Mark Twain. Authentic America is out there just waiting to be explored and after two weeks cruising amidst the Antebellum charms and gracious style of the American Queen, you will forever be changed.